Mark Bell earned his Bachelor’s Degree in Education from Texas A&M University in 1980 and began his coaching career in Killeen as an assistant coach. In 1987 he went to Clifton as the first assistant and offensive coordinator. He then moved to Rosebud-Lott to take his first head coach and athletic director position. After one year in Rosebud-Lott, Clifton hired Coach Bell as their head coach and athletic director where he and his family stayed for 3 years. Coach Bell also served as the athletic director and head coach in Lampasas before coming to China Spring. He was the head football coach and athletic director at China Spring from 1996 to 2018. 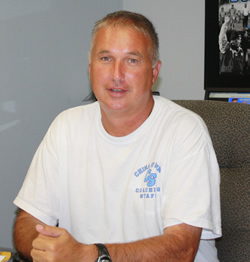 He now serves the district as Athletic Director. Coach Bell and his wife Becky live in China Spring and bleed cougar blue. Coach Bell's youngest son, Brian, is the head coach at China Spring. His oldest son, Shawn, also lives in China Spring and is currently coaching at his Alma Mater, Baylor University. Coach Bell loves every minute that he can spend with his three grandchildren. He enjoys hunting, trot-lining, and cooking out in his spare time. Coach Bell has been very blessed and he recorded his 200th win during the 2016 football season.